The temperatures in the second half of the summer have sure changed from the cool and rainy June. The work project that this blog entry focuses on is a project perfect for a warm day. Remember our pesky resident beaver? Our last battle with him was in December and all signs indicate I was victorious as we haven't seen it since. However, the damage that was incurred from the beaver was still noticeable as the Kitchi-Manitou pond level was precariously high due to a plugged pipe. 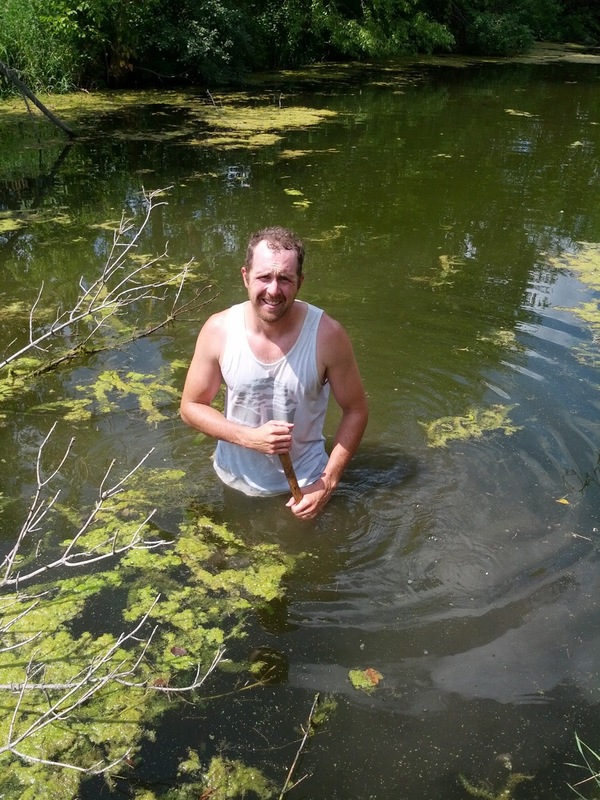 The only solution was to go for a swim and get things flowing again by unclogging the pipe. My plunger was nothing more than a spade shovel. Swimming attire was Arington Tree Farm apparel. The water temperature was perfect for the task. As far as water clarity, well that left a little to desire as the photo above can attest to. 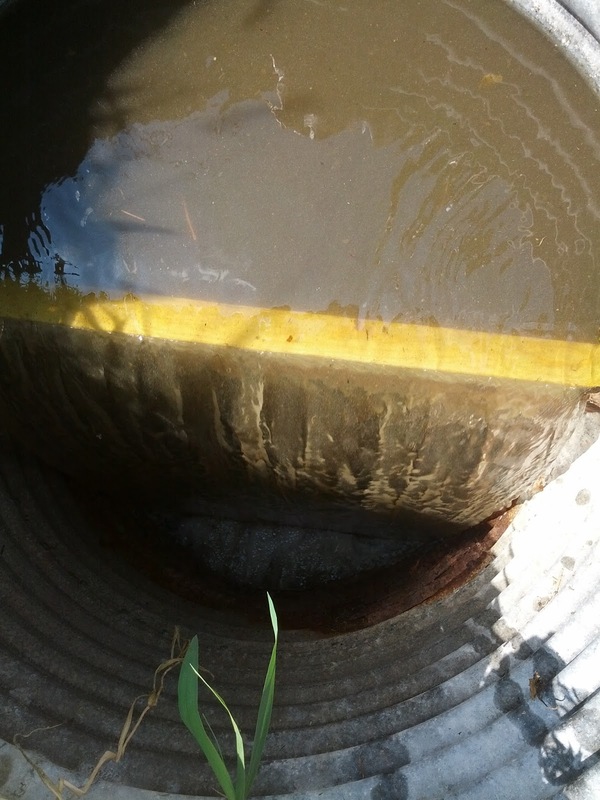 This next photo shows the manhole cover off the 36" access pipe that allows for pond water level adjustments. I cut green-treated 2x10's to drop into the channels of the u-beams. 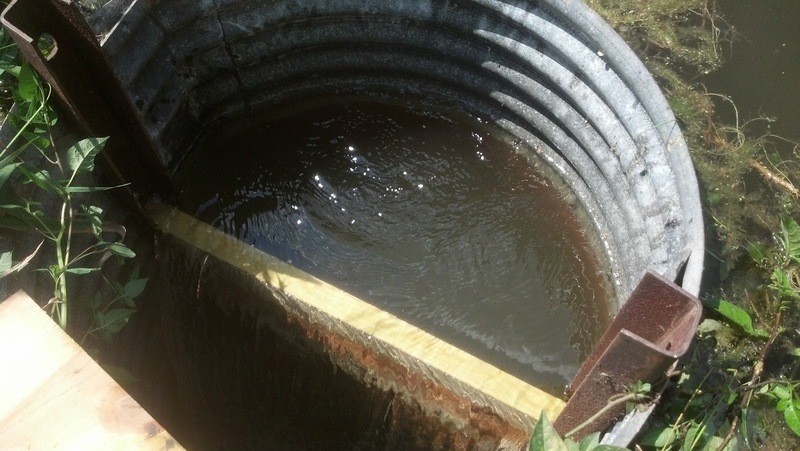 Theoretically, the water level outside the access pipe should be at the same level as the green treated boards. The photo below clearly shows that isn't the case. The under water pipe flowing into the 36" pipe was under about four feet of water and heading towards the middle of the pond. I used the shovel to "feel" my way along the length of the underwater pipe and after five minutes I was able to locate its terminus. Unfortunately, the shovel didn't provide enough sensory feedback to effectively clean out the obstruction. My only option left was the simplest; get underwater and use my hands. This proved to be very effective and after only a few minutes the beavers handiwork was undone. This last close up photo shows the flow rate we were hoping for. After only two days the ponds water level dropped to the desired depth. Stay tuned for Kitchi-Manitou pond updates as we continue to implement our pond management plan.